Winter is here and I think we all know it. The gloves, hats, winter coats and scarves are out. The rain, hailstones and the winter ice feel wind makes an appearance most days. Well it has done for us up here in North Wales and it hasn't been nice. 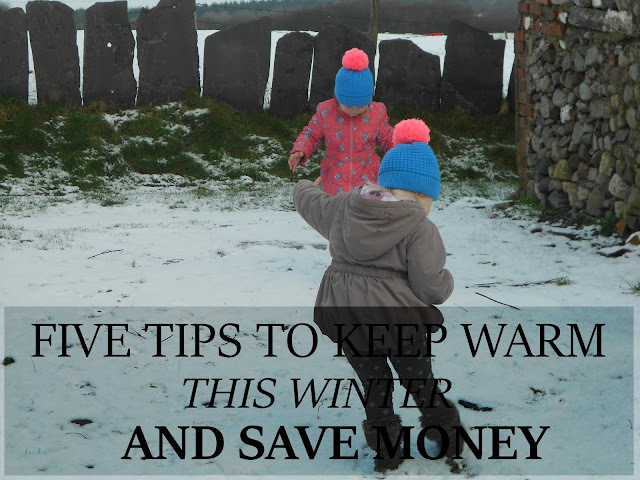 Winter can be a very expensive time of year for most people but it doesn't always have to be that way. There are ways you can safe money in Winter. If you have a log burner or coal fire you could light that up instead of the heating. If you are worried about the kids waking up in the middle of the night cold then you could always put the heating on in the middle of the night but atleast in the evenings and day you have saved money by lighting a fire. Plus this can make an evening very cosy. Again, if you are worried about your kids waking up cold, buy them so winter pyjamas. Fleeced pyjamas are great for winter. Keep them warm and cosy during the night. And make sure they wear socks! You don't have to put the heating full blast for the night. Keep it low and just buy yourself (cheaper) a new winter duvet. You are sure to get warm and keep warm once you are a sleep. If you are cold during the day, wear long sleeved told and layers such as a jacket, two tops or a dressing gown - or all. This will save you a fortune instead of keeping the heating on through out the whole day and night. Sometimes people are just in the habit of switching the heating on. Do you really need it? Could you wait a few more hours? It will save you money in the end. What tips do you have to keep warm this winter? We've got Christmas in Inverness this year. After years in Thailand I think even with layers, heating and a fire we will be freezing our butts off. Brrrr! Fab tips especially the last one. We are really bad and at leaving our heating on all the time and it costs us loads. thanks for linking up #anythinggoes.